VOID 2012 @ Object Gallery, Sydney, Australia. Just for fun the other day I played around with a one piece pattern idea i saw here to see if i could make a successful zero waste version that was in keeping with the general concept of the original. I really like the original pattern and design, its simple but interesting. I had some crisp heavy cotton from a previous project laying about in my office and its 150cm wide so based my pattern interpretation within those constraints. The design would work well with a knit or softer woven also i think. I also lengthened the skirt as I prefer a slightly longer length on me. 2: The collar follows around the back of the neck and is taken from the upper shoulder/neck area (so as the final design will reveal and frame the nape of the neck – again similar to kimono and is a lovely sensual design detail. 3: To save fabric i divided the back skirt off from the top, rotated and nested it along side the front skirt. To do this i straighten the side and centre back seams and so had to put the shaping into two darts one close to the back side seam and the other in the more usual place for a back dart. The overall placement of the skirt area allows a range of sizes to potentially fit in the basic layout by making the gather/twist or front extension larger or smaller. Also it means the length of the skirt is easily adjusted longer and shorter depending on the preference of the maker/user and potentially the width or length of the fabric you have. 4: To further allow for sizing changes i ensured the key areas of fit were placed alongside areas where exact shape/size were not as important, in this case the ‘negative space’ is the facing for the front opening, so small changes to the main garment body will not negatively impact of the function of the facing. 5: The piece generated from the back kimono sleeve/body is used to make an inseam pocket (as I hate dresses without pockets, it makes me feel too formal). This piece could also be used to extend the facing for the front if you really didn’t want pockets. 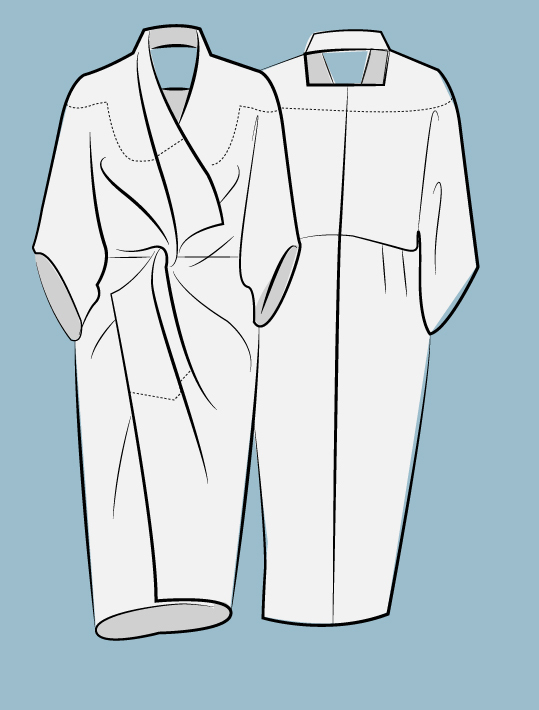 Alternatively to remove the “pocket” you could make the sleeve wider and come out form the waist. This would also change the shape of the facing but as i said this isn’t a big deal and will not alter the function of it. You can download my pattern for free here if you want to try it – Its a PDF. Be aware it is at 50% so if you’re printing it off you’ll need to scale it by 200%. Its currently about a womens size 10/12. This work is licensed under the Creative Commons Attribution-ShareAlike 4.0 International License. If your fabric is a woven and is 140cm wide you could either narrow the twist and/or extension or (if your fabric allows it) simply rotate the pattern 90 degrees. Other fabric widths can be accommodated by changing the width of the extension and/or amount of twist. You could change the size the pattern makes doing a similar thing, by widening or narrowing the waist line by moving where the twist ‘hooks’ with the other side. And widening/narrowing the corresponding hip/side seam. I sewed the garment up primarily using a very narrow rolled hem edge and a lap seaming process because i like the look of it, however you could use any process you like. It has a centre back zipper but if you made it in a knit you wouldn’t need it. If I made the pattern square then altering it to suit different fabric widths is even simpler, you can simply cut a straight section of fabric from selvedge to selvedge, rotate and sew it somewhere on the straight grain (such as the selvedge) of the base fabric to make your fabric the right width. Using this approach the fabric need not even be the same – and you could exploit this approach to create some cool colour/texture blocking effects. It also make widening the pattern for different sizes of bodies easier as while fabric width is determined by the fabric you chose its length is theoretically infinite. So how does it look? Pretty slick I think. 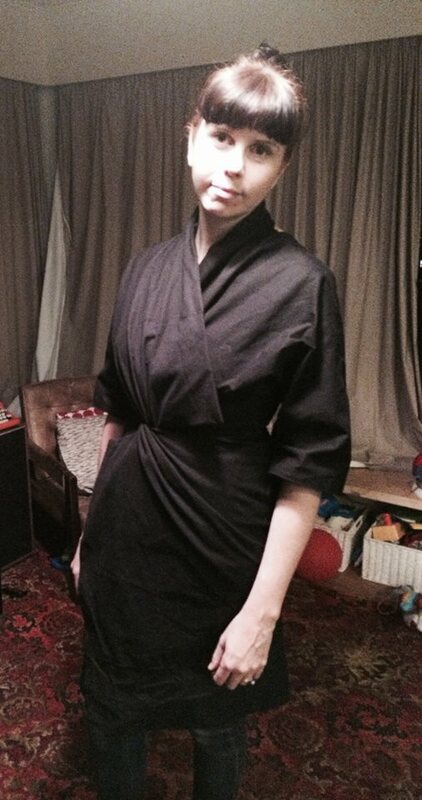 Here is a photo i took of me wearing the one i made last night (it was at 11:30pm so the lighting is rather poor). You can wear it a couple of ways – with the front extensions overlapping like i wore it here or more open like the original. It depends on how much leg/décolletage you’re wanting to show off. Me in my version when i finished sewing it at 11pm last night. This is lovely! I love the overlap look and collar. This is so clever! I immediately printed this out (scaled down to fit on one page), cut and played with it. I was wondering about the two back waist and back skirt portions on the upper corners. Since these have to be connected to the front skirt portion anyway, couldn’t you have made those upside down (with the backskirt up and backwaist down) and eliminate the side seams? Hi – yes probably! I had originally developed the pattern for 140cm wide and wanted to ensure the narrow hem of the skirt and the fit over the hip into the waist (particularly with the rigid fabric I was using) so to do that needed to flip the back skirt in order to have the cutline at an angle. However in the 150cm version this is less necessary so you’re right you probably could. In fact if you put a side/waist dart in there it would fit even better! This is amazing! I love zero waste garments. Thanks for sharing this! Sending full scale file versions now.